People are going to think you run a lifestyle blog (or something). 1. Stash random items in a trio of shelf-friendly box for a handsome storage distraction. Not-so-open storage on your open shelving is a good time, all the time. 2. 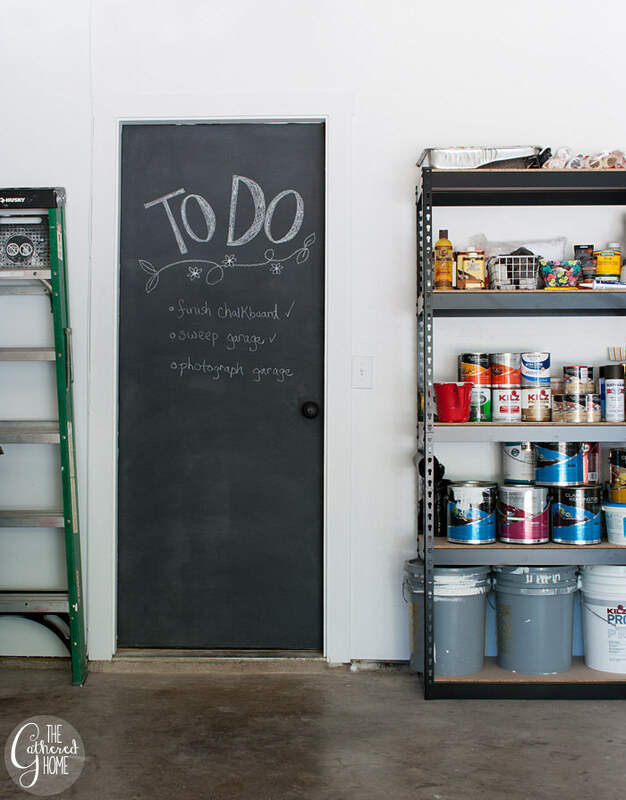 Cover door dings and marks with chalkboard paint in the garage. 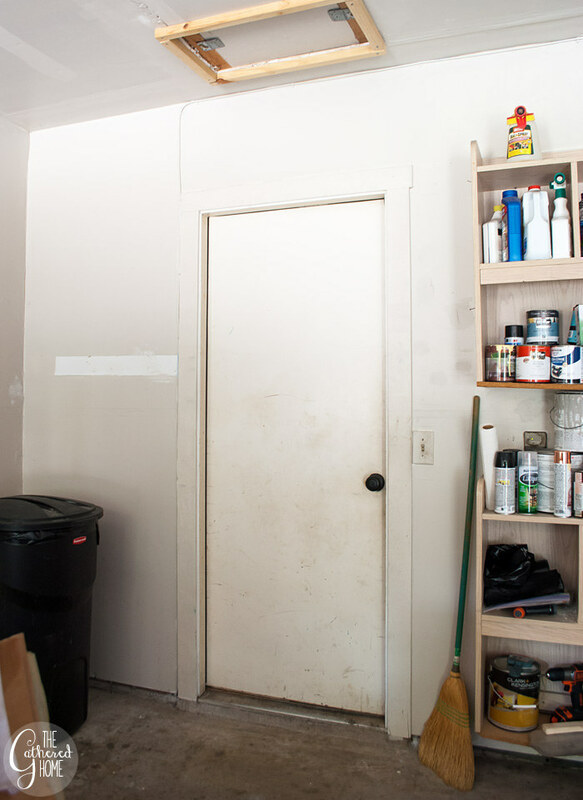 Learn about painting prep work and see the full garage makeover at The Gathered Home. Get a 30-oz can of chalkboard paint from Amazon for $9.67. 3. Paint a drop cloth as a cheerful outdoor rug to hide stained concrete or ugly patio surfaces. Check out tricks for a neat paint job at The Homes I Have Made. Get them from Amazon. $11.95 (heavy-duty drop cloth), $3.18 (painter's tape). 4. Turn unsightly wires into an ~extension~ of your flooring with this modern cord keeper. 5. Upgrade a plain light-switch cover with Mod Podge and a copy of a page from your favorite book. Be reminded daily of a favorite book passage with instructions at small + friendly. Get a 16-oz bottle of Mod Podge from Amazon for $6.97. 6. Freshen up a printed upholstered chair with paint and fabric medium. Avoid a Pinterest fail by breaking the paint-to-fabric medium ratio rules. Find out the genius secret at In My Own Style. Get Diane's fabric medium of choice from Amazon for $9.15. 7. Transform a throwaway vinyl chair with the help of specialty spray paint. The orange-to-white switch took more coats than expected. Read tips for a successful "after" at We Can Make Anything. Get spray paint for vinyl from Amazon for $13.18. 8. Mount a surge protector and coil up cords on hooks underneath a desk to fight visual cord clutter. Read up on the deets for this clever concealment at Andrea Dekker. Get them from Amazon for $9.99 (pair of 6-outlet surge-protector power strips), $7.05 (50-pack of small metal hooks). 9. Scribble away rusty furniture hardware with a metallic Sharpie. Check out (essential!) cleaning prep tips before you color at Visual Heart. Get a four-pack of gold Sharpies from Amazon for $6.08. 10. 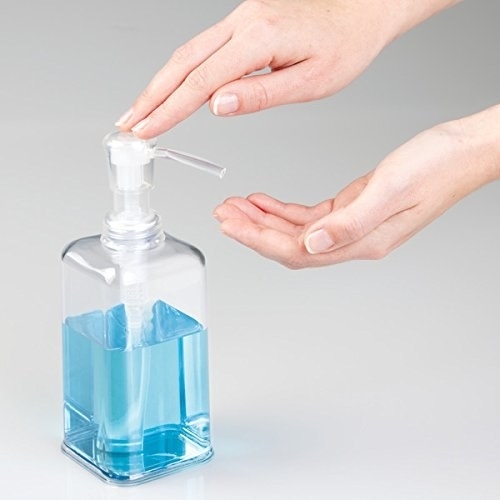 Keep embarrassing beauty products anonymous with elegant, clear dispensers. 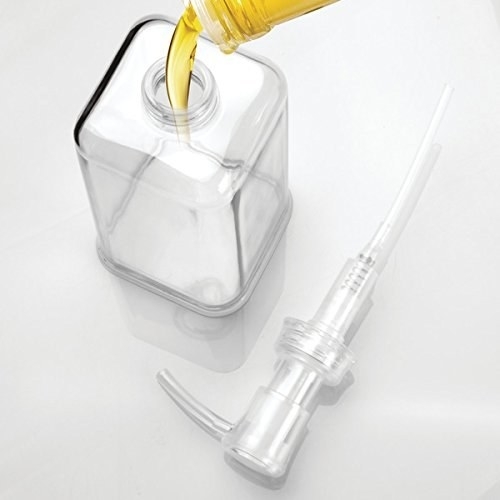 The stuff's effective, but visitors don't have to know the secrets behind your spotless skin and shiny tresses. Get a four-pack of dispensers from Amazon for $19.99. 11. And transfer laundry cleaning products to pretty storage containers for a streamlined, minimalist-pleasing look. Steal more clever organizing ideas for laundry rooms at Julie Blanner. Get them from Amazon for $25.30 (four-piece set of large glass canisters), $5.40 (six-pack of cobalt-blue 1-oz eyedropper bottles). 12. Stash grass-stained shoes in an entry bench with drawers that'll hide gross footwear. The slatted drawer fronts let smelly sneakers air out without making you look at them. 13. Mask a popcorn finish or water stains by draping scarves with thumbtacks. Get all the fun details at The Gathered Home. Buy a 100-pack of metal thumbtacks from Amazon for $19. 14. Turn your dog's crate into a design accent with a regal cover worthy of a discerning monarch. 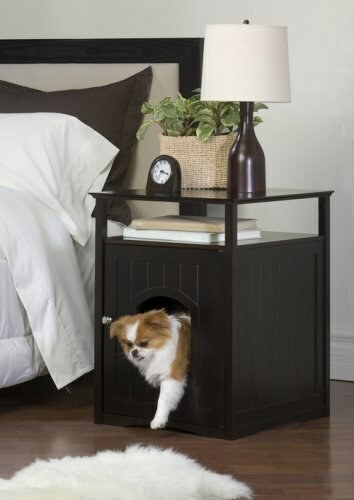 Your pup will feel like royalty. Get it from Amazon for $23.99+. Available in six sizes, four colors. 15. 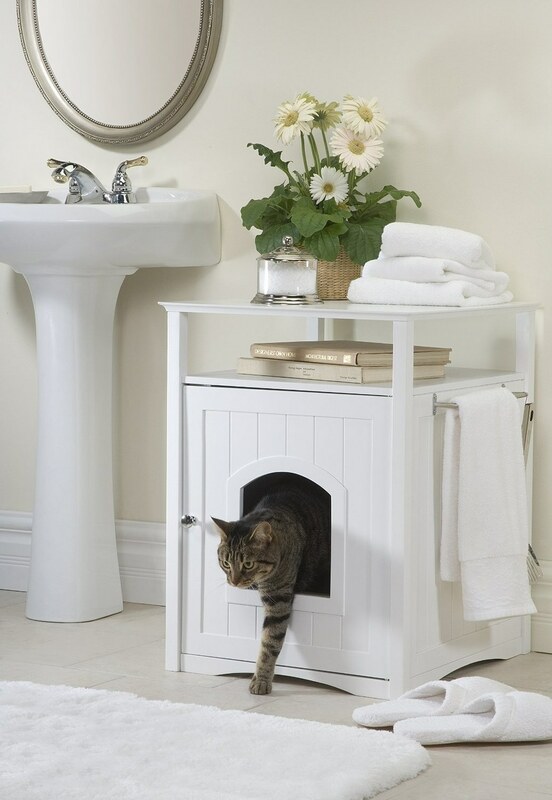 Give your cat (or dog) some privacy and disguise the litter box with a nightstand/cathouse combo. It's also good for storing books, tabletop items, and even towels! Get it from Amazon for $78.99+. Available in white (left), espresso (right), and walnut. 16. Cleverly hide your paper towels with this handsome crown-molding shelf. Use the top to park candles and other bathroom essentials. 17. Camouflage a smelly septic vent in the garden with a birdbath. The plastic cover-up includes a replaceable carbon filter to control orders. Get it from Amazon for $287.79. 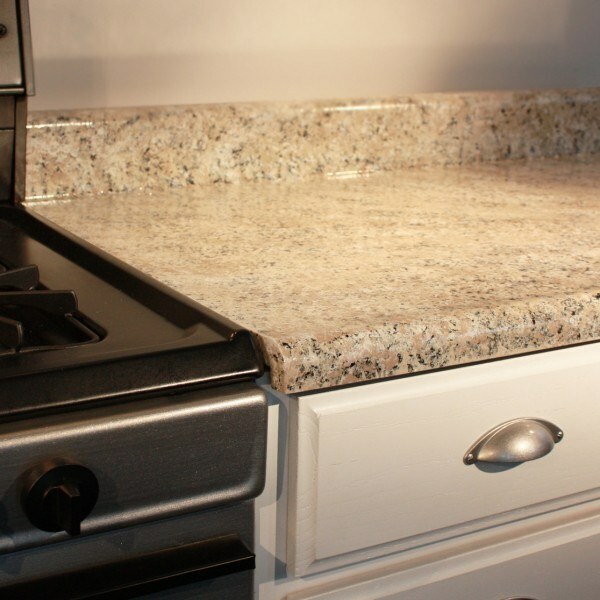 Available in faux finishes granite (shown), sandstone, and terra cotta. 18. Repaint and reupholster an OG folding chair for a whimsical new look. See the smart transformation at Our Peaceful Planet. Get a four-pack of furniture feet caps from Amazon for $6.04. 19. 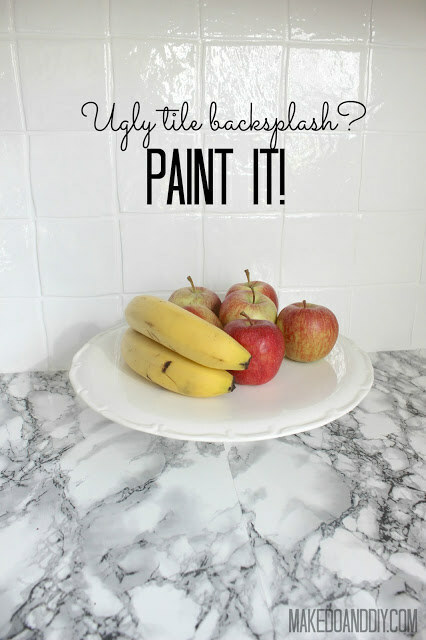 Cover a hideous tile backsplash with paint for an update that doesn't require hiring a pro. Learn from the project's trial and error at Make Do and DIY. Get a half pint of high-gloss paint from Amazon for $3.81. 20. Mask chain-link fences with a convincing roll of artificial ivy. Do some other-level privacy screening by adding it to picket fences, too. Get a 94" x 39" roll from Amazon for $29.94. 21. Overhaul a dated fireplace with spray paint in just one day. Learn the secrets behind this rapid-fire project at East Coast Creative. Get what you need from Amazon for $6.43 (surround-masking black spray paint), $5.74 (painter's tape that'll stick to brick). 22. Cover exposed screws on Ikea shelves with spiffed-up paint stirrers. See how to take this free (yep, you read that right) hardware store paint tool and turn it into a pretty patterned surface at Ciburbanity. 23. Tuck pool and gardening chemicals in a weather-safe storage shed that'll keep it safe, dry. Get it from Amazon for $177.78. 24. Cover up a paint-color fail with worldly maps and pushpins. Get the criminally easy deets at The Inspired Room. 25. Conceal a thermostat or security system by hanging a canvas wall art piece on hinges. Check out the easy-access tutorial at Bliss Bloom Blog. Get a 12-pack of mini hinges from Amazon for $7.58. 26. Stash your trash and recycling beneath the counter with a rolling system. One bin for trash and one bin for recycling — both out of sight. 27. 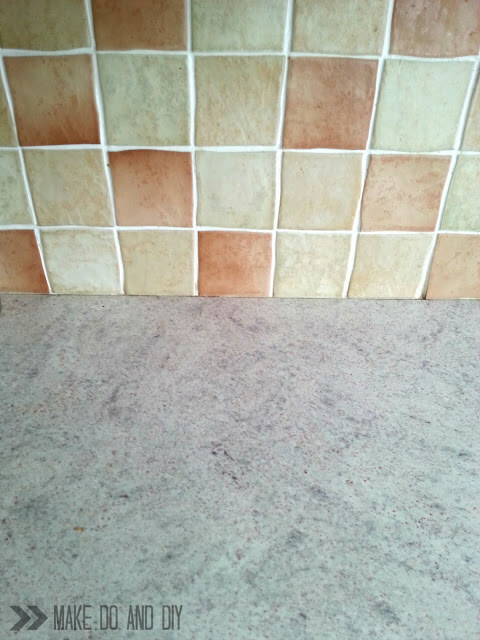 Fake a granite finish on a laminate countertop with a paint kit. The kit even has an instruction DVD for painting noobs! 28. Corral hair tools in a hangable carrier you can store under the sink when not in use. The good kind of containment. 29. Block a utility panel from view with a pallet-ish cover that won't get you in hot water with your utility company. Check your local utility company's requirements about reading the meter before you tackle this project. (Tasha's meter can be read through the panels and the cover-up is easily removed.) Get her building directions at Designer Trapped in a Lawyer's Body. 30. Give an old appliance a sleek stainless-steel look without forking over a ton of cash by covering it in contact paper. See how to revamp a black dishwasher at Julie Blanner. Get a roll of stainless steel–look contact paper from Amazon for $14.86. 31. Craft a woven wall hanging to cover up wall dings in a rental or until you can repaint. See how how to conquer this on-trend piece at Earnest Home Co.
32. 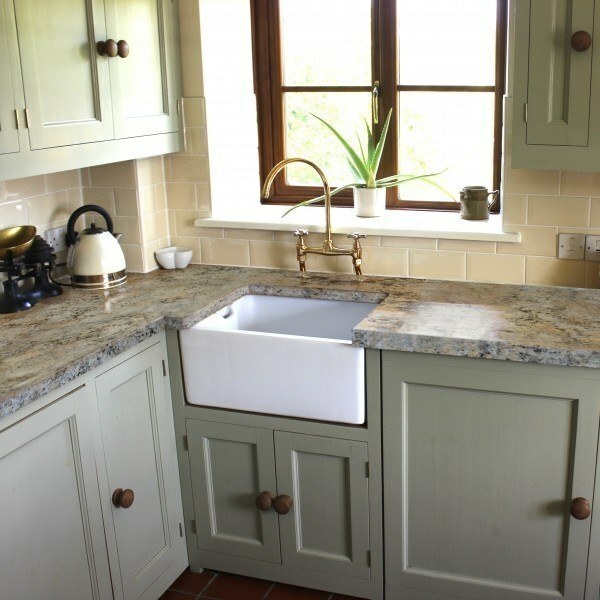 Find a happy medium between a pedestal sink and vanity by fitting a specially designed cabinet around the sink base. It's cheaper (and way easier) than starting from sink scratch. Get it from Improvements for $149.99. Available in walnut (shown), cream, and white. 33. Add crown molding and trim to an Ikea bookcase and paint the back a bold color for a pricey custom look. Check out the innovative tips for dressing up a Billy bookcase at Centsational Girl. 34. Make a drum pendant ceiling light fixture cover-up that won't compromise your relationship with your landlord. Follow the easy project directions at The Blissful Bee. 35. Hide an oddly placed light switch in plain sight by making it the center of a gallery wall. See how to deal with the weird decor sitch at Our Fifth House. 36. Disguise wire shelving as floating wood shelves that you can take with you when you leave. Find out how it's done at This Girl's Life Blog. 37. Mask dated shower doors by hanging curtains. Nope, you can't use regular shower curtains. Invest in two long regular curtains (about 84") to fully mask the doors. See how to get the right effect at Maria Killam. Get them from Amazon. $19.39 (decorative shower rod), $9.24+ (pair of 54" x 84" curtains).